Vitamin B-12 is an essential vitamin required for healthy blood cells and nerves. Dietary animal products, such as fish and poultry, are the main source of B-12, providing significantly larger amounts than the daily requirement of two to three micrograms. Deficiencies arise in strict vegetarian or vegan diets and in those who are unable to absorb dietary sources. Symptoms of B-12 deficiency include anemia and nervous tissue dysfunction. Neutropenia--or low neutrophils, which are a type of white blood cell--may also occur. Vitamin B-12 plays a key role in cell development by supporting gene methylation, a physiological process that allows your cells to turn genes on and off. Methylating genes hinders their activity, allowing your cells to focus on the genes needed at a given moment. It also helps combat DNA damage, which can contribute to cell death. Getting enough B-12 in your diet helps you make red blood cells, and fights DNA damage in white blood cells. The hallmark of B-12 deficiency is a condition known as megaloblastic anemia. 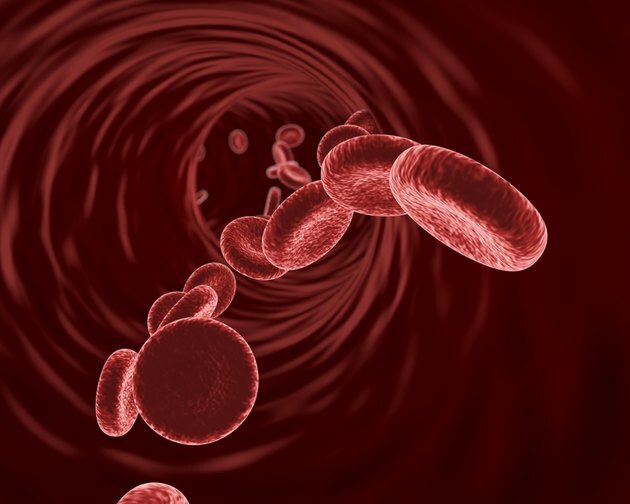 This condition is characterized by a defect in red blood cell production, causing these important oxygen-carrying cells to be both fewer in number and larger than normal. In advanced cases, anemia may be accompanied by low levels of other blood cell lines, including platelets and white blood cells. Neutrophils are a type of white cell, and a low neutrophil level is called neutropenia. Neutropenia is defined as a neutrophil count significantly below normal levels. Neutrophils are a type of white blood cell active in fighting infection. Neutropenia therefore results in increased susceptibility to infection, specifically by certain types of bacteria and fungi. The risk of infection is related to the severity of neutropenia. Key nutrients, including folate, copper and vitamin B-12, are among the causes of neutropenia. Replenishing the nutrient leads to an increase in neutrophil count. Microorganisms are the ultimate origin of vitamin B-12 in the food chain. Animals obtain the vitamin from the bacteria in the digestive tract, or by eating other animals. Humans are unable to absorb the B-12 produced in the gut, so you must obtain it in your diet. Fish is an excellent source, and both beef and poultry provide large amounts. Plants and vegetables contain little of the vitamin, save that contributed by microbial contamination, as occurs in unwashed vegetables. Hence, plant-based diets require supplementation. Because your body is able to store significant amounts of vitamin B-12, deficiencies due to diet are rare except in strict, long-term vegans. Other causes include malabsorption, deficiency of a factor essential to the absorption of B-12, known as intrinsic factor and infestation with tapeworms. These conditions may require treatment with injectable B-12. In addition to the symptoms mentioned, a lack of B-12 can make you dizzy or forgetful, and may affect your balance. If you suffer any of the symptoms of B-12 deficiency, talk to your health-care provider.